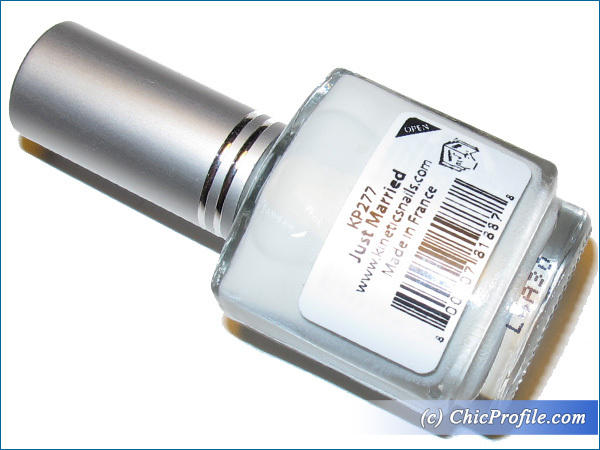 Kinetics Just Married is the lightest nail polish from all the 10 shades of Kinetics Magnolia Summer 2014 Collection (swatches/ photos). 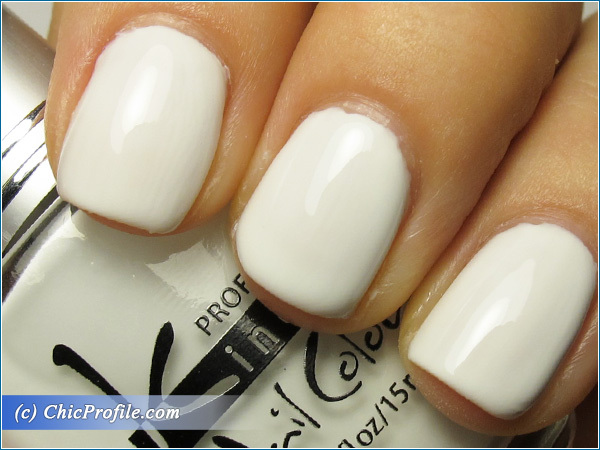 As the name itself suggest this color can also be used by all brides to be in their special day for a elegant manicure. 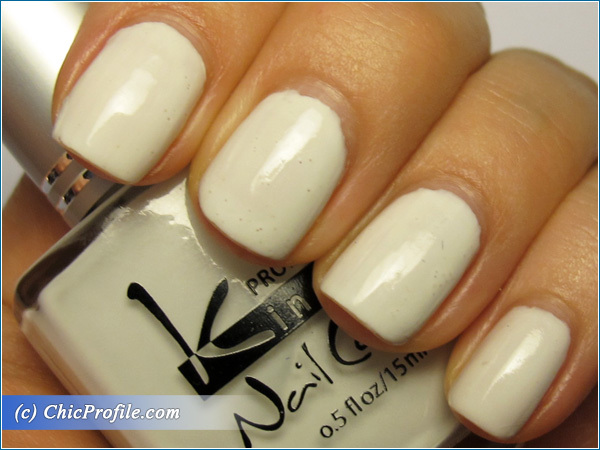 Kinetics Just Married Nail Polish (€6.00/ 25.00 Lei/ £3.60 for 15 ml/ 0.5 fl oz) is a bright pasty white, a perfect pure white without any grey or yellow undertones. The color looks fully opaque in two coats and delivers a shiny effect. In one coat it looks semi-opaque and a bit streaky and uneven so I totally recommend applying the second coat but not the third as the polish may be to thick. It has a medium thick creamy consistency and can be used as all over the nail polish but also to create a simple and elegant french manicure. It applies easily but on the first coat the polish looks a bit streaky but without pooling or bubbling. 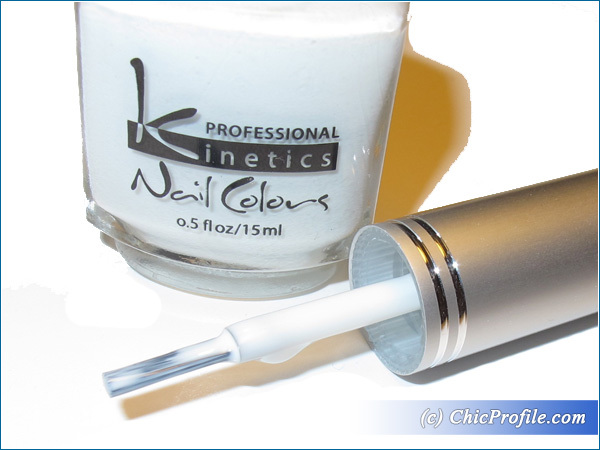 I applied Kinetics Nano Seal Nail Treatment (review, swatches) as a base coat on all of my nails and for a more glossy effect and long lasting color I used Jordana Yellow Out Top Coat on my left hand nails. The polish took under 5 minutes to completely dry but when that happened I noticed some tiny bubbles but only of the nails where I’ve applied top coat. I believe this color doesn’t work well with other brand’s top coat as on the other nails where I’ve applied only 2 coats of Just Married the color looked perfect without any bubbles. I had 5 days wear with this formula before I decided it was time to remove it but as you can see from the photos bellow I very minor tip wear on the nails where I used top coat while on the other nails which I kept without protection I had minor tip wear, without chipping and a more mattified color. 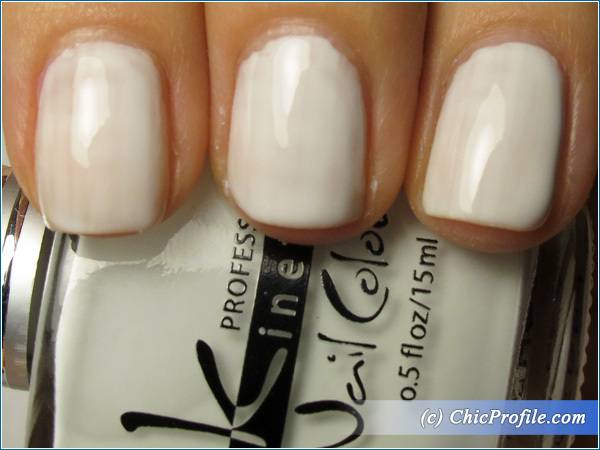 I’ve also used Kinetics Just Married the other day for a french manicure and everything looked perfect without any bubbles when I used Kinetics Nano Shark Emergency Treatment (review, swatches) as a top coat. Stilla Holiday 2010 Makeup Collection is Here! I have never worn white nails. This is very pretty and the staying power very impressive.